Stoke City recovered well from the opening loss to Everton, defeating Arsenal at home before sharing spoils with West Bromwich at the Hawthorns, but they will not have bigger fish to fry as they face red-hot Manchester United. 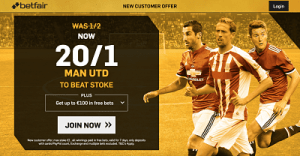 The Red Devils won each of their first three fixtures, scoring 10 goals and conceding none, so you will be glad to hear that new Betfair customers who sign up through this link are quoted 20/1 special price. They also need to enter promo code ZFBDEE during the registration process and then place a max £1 bet on Man Utd in the Match Odds market at the special price. All winnings are paid as free bets.